This recipe is inspired by a casserole dish I had in Stockholm. Chanterelle mushrooms were everywhere and I immediately took to their earthy, buttery flavour, much richer than the standard mushrooms I was used to. This recipe combines them with many of my favourite autumnal ingredients, creating a nourishing and warming casserole-like dish. For the simplest option, serve it with grains and vegetables or atop a cloud of white bean mash. Heat the oil in a large saucepan and, once hot, add the chestnuts, garlic, onion, mushrooms, beetroot, lentils, sage and rosemary. Sauté for 15 minutes and then add the coconut milk, vinegar and half of the stock. Bring to the boil, then reduce the heat and simmer for 20 minutes. Gradually add the remaining stock to loosen it, but you may not need it all. Meanwhile, prepare your white bean mash. Put the oil and beans in a saucepan and set over a medium heat. Add half of the water or plant-based milk and then gently begin to break up the beans using a fork or a potato masher. Add the remaining water or plant-based milk and continue to stir and mash until the beans completely loose their shape and the mixture becomes smooth and fluffy. Season to taste and remove from the heat. If you want a smoother result, blitz the mash in a blender for 30 seconds, with a little extra water or plant-based milk, if needed. Set aside. 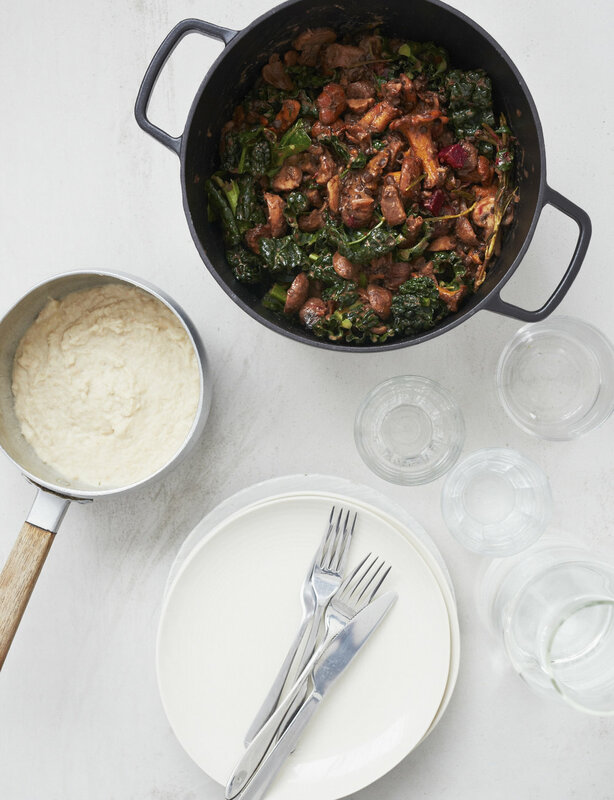 Add the spinach and cavelo nero to the casserole and season with salt and pepper. Once the greens have wilted and the liquid has reduced, remove from the heat and serve instantly along with the mash. Preheat the oven to 200°C . To make a shepherd’s pie variation, layer the white bean mash on top of the casserole. Bake for 15–20 minutes until the mash turns a warmer shade of white and the casserole begins to bubble underneath. 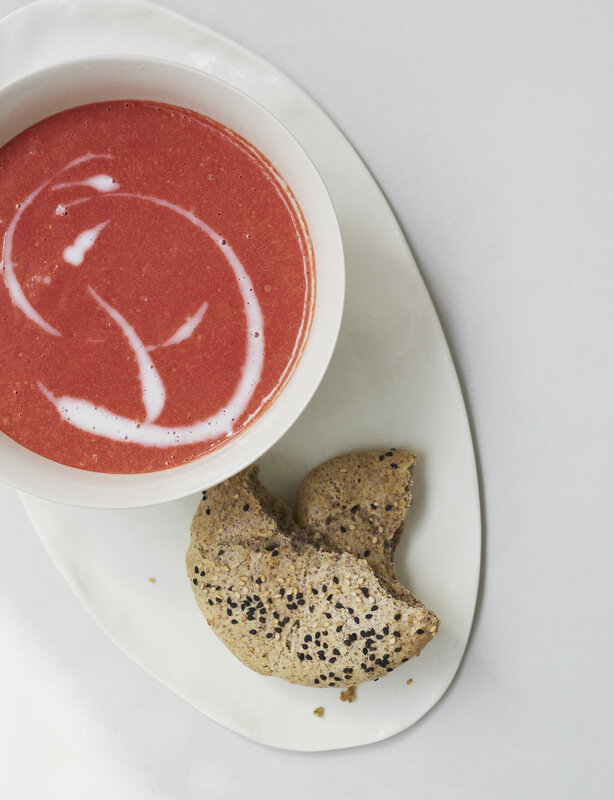 This hearty soup uses ingredients associated with the root chakra (page 326), which works to keep us grounded with the Earth’s energy and, when balanced, can increase confidence, energy and openness. Signs of a blocked or misaligned root chakra include short temper, lack of motivation, anxiety and general frustration. Eating foods associated with this chakra can help to release these emotions. Serve with Magic Vegetable 'Bread' Rolls (page 314), toasted Miracle Bread (page 314), or Crackers (page 178). In a large saucepan or stockpot, heat the oil over a medium heat. Once hot, add the onion, garlic, ginger and coriander and sauté for 5 minutes. Add the beetroots, carrots and broth. Bring to the boil, then reduce the heat and simmer for 20 minutes or until the beetroot is soft. Allow to cool slightly, transfer to a blender (work in two batches if necessary) and add the coconut milk. Blend on a medium speed for 30 seconds and then increase to the highest speed for 10 seconds. Add more broth or water to thin the soup if it is too thick. Return to the saucepan, add the thyme, season to taste with salt and pepper and add the lime juice, if using. Heat through, then divide among bowls and serve immediately. Top with Nut Parmesan Sprinkle (page 313), a knob of Avocado 'Butter' (page 308), herb-infused oil (page 313) or a swirl of extra coconut milk. Blend any leftovers with a can or two of chickpeas, to make a vibrant root- vegetable dip.